Just before Ugadi, the King of Fruits have arrived in the markets. Keeping a way the tradition to wait till ugadi to taste the first mango, people are tempted after seeing the yellow fruit. 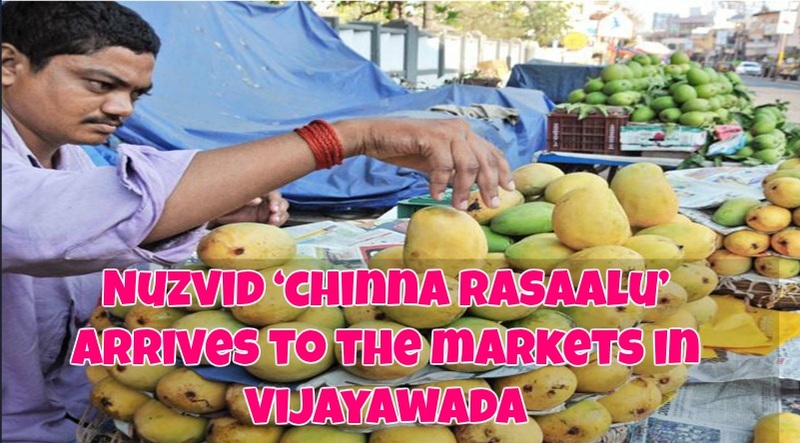 With the harvesting of Nuzvid ‘chinna rasaalu’ started, the markets are slowing picking pace and vendors have stopped selling other fruits, and turned into selling Mangos. The roads of Nirmala Convent, heading towards Patamata are filled with Mango Vendors. Despite the sky rocket prices, people are desperate to taste the first mango of the season. With harvesting of Nuzvid ‘chinna rasaalu’ begun, the fruit has begun to arrive in the city. Barely two-days after the summer fruits’ arrival in the market, people scurried to get a taste of the fruit despite the skyrocketing prices. Tempted after spotting the yellow fruit on their way home, many of the people are found skipping their traditional obligation of waiting till Ugadi to taste mango. Based on the size of the fruit, the price of chinna rasalu is ranging between Rs. 300 and Rs. 500 a dozen.